Sammy's Lounge on Cedar Street in Holt. I haven’t felt very well the last few days. Nothing serious. Just a summer cold. Probably had the air conditioning blowing on me too much while I was sleeping. Because of that, I wasn’t really in the mood to cook dinner. I looked through the freezer, the cupboards, the fridge…nothing looked good, so I told J I’d pick her up from work and we’d just go out. I didn’t want to go to far from home and about the only thing that sounded good to me was a greasy burger. 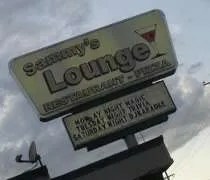 We seem to always drive by Sammy’s Lounge but we’ve never stopped. Since it’s fairly close to both J’s work and our home, I thought it would be a good choice. Sammy’s Lounge is on Cedar Street in Holt just past the downtown area. The entrance is actually in the middle of the parking lot. They have a great outdoor bar and beer garden that you have to walk through in order to get inside. We headed inside where we ran into a hostess station. One of the waitresses saw us and showed us to a table in the non-smoking side of the restaurant. The Burger King on Cedar Street in Holt. Sorry, I’m a few days behind in blogging. 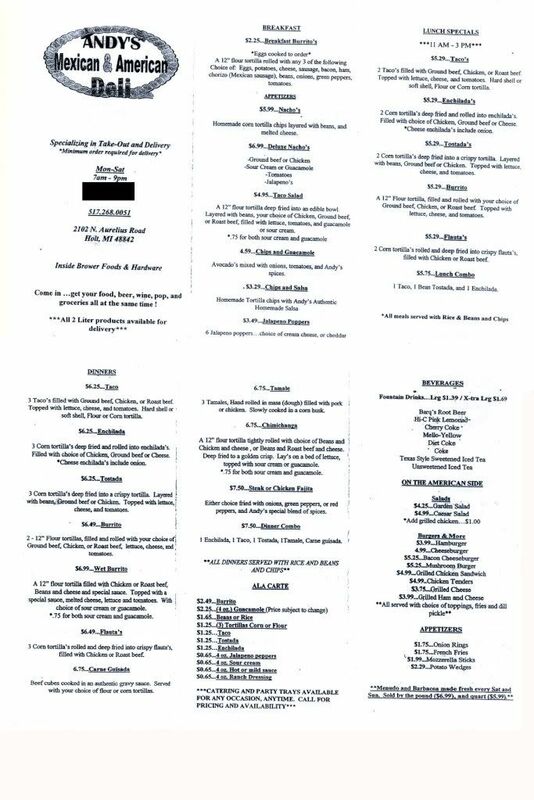 Things are a little hectic at MMD World Headquarters which is why, on Monday night, I suggested a fast food run. Usually, we do Taco Bell or Steak ‘n Shake, but I thought we’d mix it up. 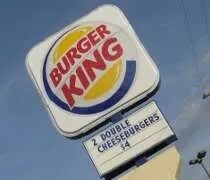 I couldn’t tell you the last time I had Burger King and there’s one right down the street. J didn’t object. We chose the Burger King on Cedar in Holt. It sits near the Holt/Lansing city line right across the street from the Kroger. There is an entrance on Cedar Street, but there is also one on Willoughby which is easier to access than crossing traffic. As I’ve said before, I despise drive thrus, so we went inside. The place was desserted at 7:00 on Memorial Day. We were the only ones inside and there was just one car in the drive thru. Since we hadn’t eaten at a BK in a long time, we needed a minute to look over the menu. Finally! 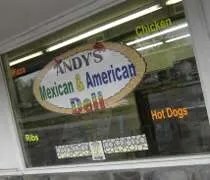 I think I’m probably the last person in the South Lansing/Holt area to grab lunch at Andy’s Mexican & American Deli in Holt. We’ve tried a couple times and even got up early yesterday to try and get lunch before I had to be to work at 2:00. When I called to make sure they were open, I got an answering machine saying Andy changed his hours and was closed on Sunday. Last night, J and I decided it was time to clean out our closet. We ended up filling six garbage bags with clothes we haven’t worn since we moved here. Since we were going out in the rain to drop them off at Goodwill, we thought we’d double back to Holt and stop in to Andy’s for lunch. 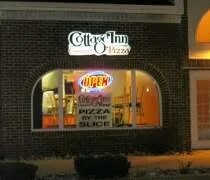 Cottage Inn Pizza on Cedar Street in Holt. J converted me. I used to be a deep dish pizza guy, but where she grew up on the South Side of Chicago, thin crust rules. Over time, she broke me down and now all I want is a thin and crispy pie. We haven’t had a whole lot of luck finding those in Mid-Michigan. It’s not because no one does it. It’s because we never looked. When you call and just order a large pizza, most places give you the same crappy not quite thin, not quite thick crust. If you ask, you just might get a good pizza. I had heard about food auctions in other cities, but I had never heard any being publicized here in the Lansing area….that is until tonight. I noticed this story from WLAJ.com on my RSS feed. It might seem a little unconventional, buying your groceries at an auction instead of a supermarket, but some people we spoke with say the savings is unbelieveable [sic]. For thrifty grocery shoppers, clipping coupons and buying generic brands isn’t good enough anymore, and here in Holt, food auctions are seeing an increase in popularity. “I think over the last 6 months we’ve definitely seen an increase. In February we had about 115 bidders, we only have 96 chairs back there,” said Chris Crepeau, of the Michigan Auction Sales. The food is cheaper because it is purchased in bulk and may be nearing its sell by date. “Some of the things might be close to going out of date, but 99% of everything we sell is in date,” Crepeau said. But in date or not, Fox doesn’t let that stand in the way of a bargain. “It’s all good stuff, I’ve never had anything that was bad,” Fox said. 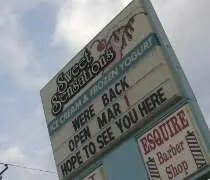 Sweet Sensations on Cedar Street in Holt. Ah, spring. With spring comes one of my favorite things. The opening of the ice cream stands. J and I spent all winter sitting at home wondering where we could go for soft serve ice cream. All the stands close during the winter. There’s no Dairy Queen restaurant and Culver’s is in Okemos. On our way to Mason for dinner, we noticed that there was an ice cream stand on the way opened. As we drove by, we decided to skip dessert at Big Boy and pick up some ice cream on our way home.